Buffalo Sabres owner and Penn State alumni Terry Pegula changed the foundation of the Penn State hockey program forever. A university changing financial contribution gave PSU a remarkable hockey arena, along with a great weight room and other countless amenities. The donation was a driving force to what the Penn State hockey could become. #PSU Assoc. AD Joe Battista on Terry Pegula: "There is no greater ambassador for the growth of hockey in Pennsylvania and Western New York." Terry Pegula and his wife gave Penn State the largest private gift in University history,donating $88 millon on September 17th, 2010. In 2012, the donation was later increased to $102 million. The Pegula Ice Arena was founded and led to two varsity programs, a men’s and women’s varsity hockey team. There are two ice sheets in the arena, along with a top notch weight room and other necessities required for Division one hockey. Penn State’s next goal is to grow as a program. The Nittany Lions enter their second season in the Big Ten this year, following a 3-16-1 campaign in their first year in the conference. There will be challenges ahead for PSU, but Gadowsky liked what he saw from his team last year. The road to building a conference contender is a long and tedious one. The trek will take Gadowsky and his staff numerous years to build a formidable recruiting class. With their facilities, atmosphere and school, Penn State will be an attractive place for prospective players over time. Gadowsky spent seven seasons as Princeton’s head coach before coming to Penn State, where 20 players who played for him earned professional contracts. During his first five years with the Tigers, Princeton increased their win total. He orchestrated a second straight NCAA tournament appearance during the 2008-09 season at Princeton, including a program-record 22 win year. Defenseman Patrick Koudys will Captain the Nittany Lions in his final year with the team. 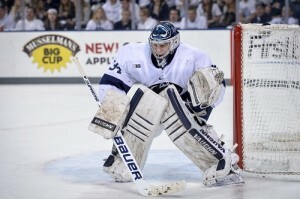 He’s property of the Washington Capitals and could be in line for a pro contract following his senior season at PSU. Nittany Lions have had four players drafted by NHL clubs in their program history. Koudys played in 36 games last season, compiling two goals and six assists. He blocked 79 shots on the year, developing his abrasive style on the blue line. Koudys plays a simple game, not flashy offensively, but is trusted in his own end. Koudys attended Washington’s development camp this season, along with teammate Zach Saar. First-year Capitals head coach Barry Trotz and his staff were impressed by what they saw from the PSU blue liner. Sophomore Zach Saar is expected to be held out of action until January at the earliest according to the PSU head coach. Saar contributed 11 points in 33 games for the Nittany Lions last season, becoming an intregal part of the Penn State hockey team for the coming seasons. Penn State will utilize three different net minders in the upcoming year: Matt Skoff, P.J. Musico and Eamon McAdam. Skoff, a junior, is expected to earn the bulk of the starts. He totaled an 8-13-2 record between the pipes last season, posting a 2.95 goals against average and .906 save percentage. McAdam is a New York Islanders draftee and could play a bigger role as he develops. Penn State entered the international scene, recruiting defenseman Erik Autio. He comes over to the states from Finland, after spending time on their national team. Penn State makes a few marquee trips this season, including an early season road trip to Alaska. The Nittany Lions will play in a few NHL rinks including MSG, Consol Energy Center and the Wells Fargo Center. You can view PSU’s schedule, here. Guy: “The credit goes to Penn State. ..The student body is excited to support anything.” Selling PSU hockey hasn’t been tough. Penn State will continue to attempt to improve their growing program as a process. There are parts in place that can make the University an attractive place for prospect student-athletes. PSU plays in a competitive conference and the Pegula Ice Arena provides a great atmosphere. Gadowksy sees no reason why his program can’t become something great.